Boy, for what was ultimately a three-point game that came down to Blair Walsh facing a 52-yarder...it sure would have been nice to have three more points, wouldn’t it? Hindsight remains perfect, but Walsh came up short on his final try and the Seahawks fell to Atlanta 34-31, and naturally all the attention comes back to Carroll’s slightly bizarre fake field goal at the end of the first half. Down seven, with seven seconds left and Seattle facing a fourth-and-1 from the Falcons’ 17, Carroll rejected what would have been a 35-yard attempt in favor of an ambitious fake, a shovel pass from holder Jon Ryan to tight end Luke Willson. It failed miserably. That’s DT Grady Jarrett busting the play and dropping Willson immediately, for a four-yard loss. 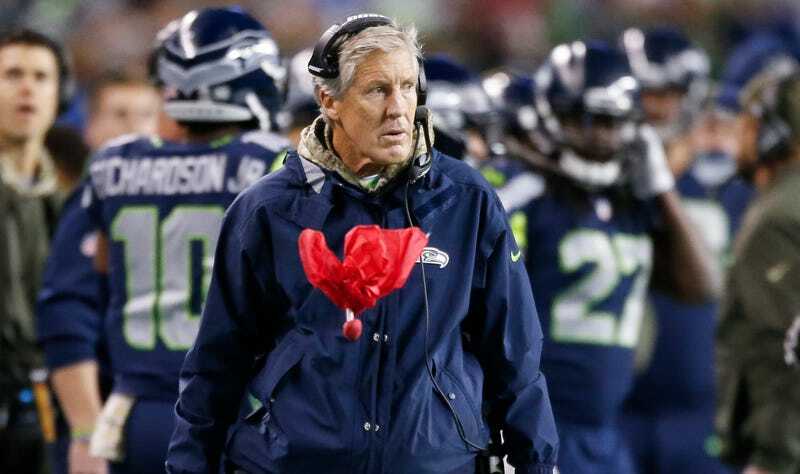 Pete Carroll, what went wrong? “It would have been a really good call if we would have made it,” said Carroll. Well. Yes. As would most calls. This call was made especially with the Falcons in mind. Carroll said film study had convinced him Atlanta’s defense was such that Willson should have easily sprung for a touchdown, but Jarrett “wasn’t supposed to be there.” Stupid defenses, always ruining things. Willson agreed it was a sound call, the defenders just executed differently than they had on tape. “It was kind of a look that we were waiting for,” Willson said. “It’s something that they’ve done all year. I don’t know why, but for this game they changed it up and it was a first time thing for them so obviously it didn’t work. It is what it is I guess. I still find it hard to believe that Willson, no speedster, could have edged the entire defense and made it the 17 yards for the score. And with seven seconds left, there wasn’t time to pick up the first down and use their last timeout for one more play (the play as it was took three seconds, and they didn’t even get back to the line of scrimmage), even though Carroll mused openly about that. But what would have even been the benefit of that? A shorter field goal than 35 yards? This feels like an obvious case of a coach trying to be too clever. The Seahawks had a trick play, one they were confident of using against precisely this team and precisely the defensive look they were giving. So Carroll used it the first chance he got, even if the situation—downs and distance and time remaining, to say nothing of the score—didn’t really call for it. But when you’ve got a new toy, you look for an excuse to play with it. It was a very bad game for Carroll, who made a terrible challenge on an obvious Doug Baldwin drop early in the fourth quarter and forfeited a timeout, which came back to haunt Seattle on its final drive. Maybe with a timeout, they get closer than 52 yards and Walsh nails that field goal. Maybe without the fake in the first half, that last Walsh field goal is for the win. This game’s on Carroll.